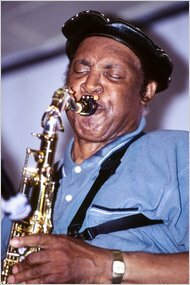 Fred Anderson, a tenor saxophonist who tied the bebop innovations of Charlie Parker to the explorations of later avant-garde musicians and who owned the Velvet Lounge, a South Side Chicago club known for fostering the careers of emerging players, died on Thursday. He was 81. In 1982 Mr. Anderson, who was earning a living with odd jobs, including bartending, took over a workingman’s bar at 2128 1/2 South Indiana in Chicago and slowly began to transform it. 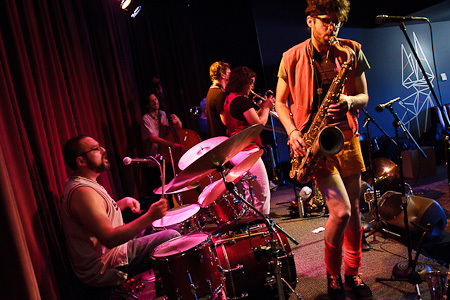 At first he opened it on alternating Sunday nights for jam sessions for local musicians; eventually he turned it into a full-time music room where he led his own bands and booked others, especially experimental players who attracted the most serious of serious jazz aficionados. He named it the Velvet Lounge after an audience member complimented him, possibly inaccurately, on his smooth and velvet sound. 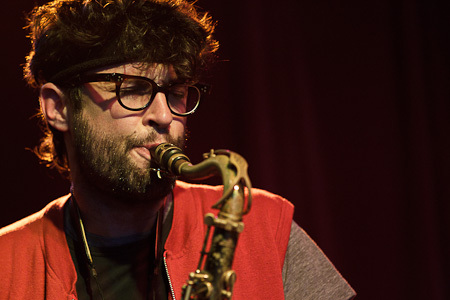 Particularly since the early 1990s, when he began charging a cover, many prominent musicians — including the flutist Nicole Mitchell and the saxophonist Ken Vandermark — have had their careers nurtured there. 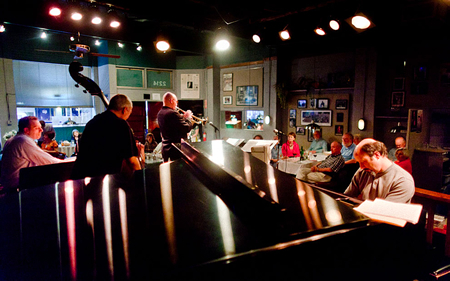 I went to Bake’s Place in Issaquah on Friday, June 11, and had the great pleasure of seeing vocalist and trumpeter extraordinaire Jake Bergevin. He is one of the nicest people you’ll meet and has a mega talent to match with his effortless crooning vocalese, inventive original compositions, and sensitive re-imaginings of works by such artists as Kurt Elling and Leonard Bernstein. His rendition of the classic standard “I’ve Grown Accustomed to Your Face” and a fresh arrangement of Sting’s “The Girl with No Regrets” were shining examples of his varied, eclectic repertoire. Joining Jake that evening was an exceptional rhythm section comprised of Dan Kramlich on piano, Brad Boal playing drums, RJ Whitlow on bass, and local favorite Susan Pascal playing vibes. Jake’s second set was themed around songs of New York and the debut of brand new material for him. Especially wonderful were his takes on “New York, New York”, “Let Me off Uptown” and a couple of songs dedicated to two famous NY bridges, “Chelsea Bridge” and “Brooklyn Bridge”. 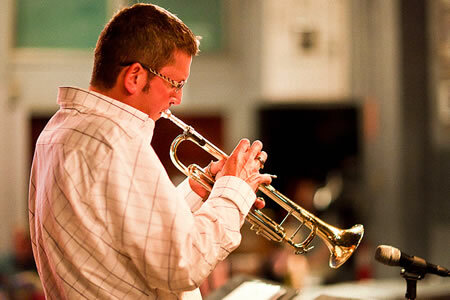 Jake is the gifted jazz band director at Edmonds-Woodway High School and in May gained national recognition for his band’s participation in the famed Essentially Ellington competition at Lincoln Center in New York City. He also fronts his popular big band, “Javatown Swing Orchestra” and will be performing with them for the 13th year in a row at Ellensburg’s Jazz in the Valley on Saturday, July 31st. 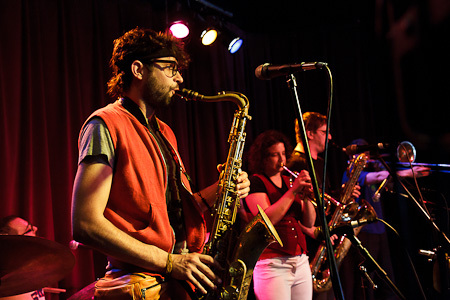 Other up-coming performances include Pacific Lutheran University’s Jazz under the Stars on Thursday, July 15, The Bloedel Reserve Concert Series (Bainbridge Island) on Saturday, July 17 and The Mill Creek Community Summer Concert Series on Thursday, August 5. Reptet performing at the Seattle Drum School Georgetown last Saturday. Thomas Marriott celebrated the release of his new CD, “East-West Trumpet Summit“, which is currently #1 on the JazzWeek National Airplay Chart and was recently featured on NPR’s Morning Edition. The “East” portion of the Trumpet Summit is usually Ray Vega, but because of family commitments Vega wasn’t able to make this performance. In his absence, Vern Sielert (still “East” of Seattle as Sielert is now teaching in Idaho), joined the band which also featured Bill Anschell on piano, Phil Sparks on bass and Matt Jorgensen on drums. A great sound on a summer evening. Note: Benny Powell’s last studio recording as a leader was for Origin Records. Click here to view/listen to that recording. 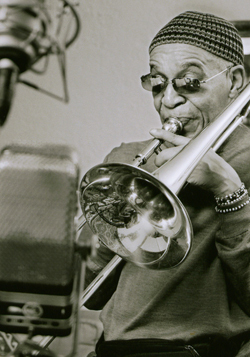 The Count Basie Orchestra is announcing that trombonist Benny Powell has died at age 80. Powell is best known for his role in the Basie band of the 1950s and early ’60s — he took a brief solo on the hit recording of “April In Paris” — but he also held spots in the Lionel Hampton Orchestra, the Thad Jones/Mel Lewis Orchestra and many, many other top ensembles. He was busy as a recording studio, Broadway and television musician, and also worked with high modernist jazzmen like pianist Randy Weston and clarinetist John Carter. I asked [Powell] once what he said … to his students, and he replied, “Straight ahead and strive for tone.” Which seems to me like pretty sound advice for all kinds of strivers. 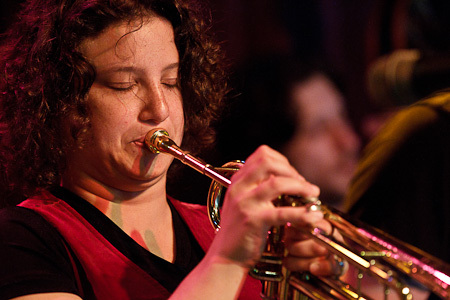 Recent CDs by some great resident talent is featured this Sunday (6/27) on Jazz Northwest. Included will be new CDs by Dave Peck, The Seattle Repertory Jazz Orchestra, Dina Blade and The Ziggurat Quartet among others. 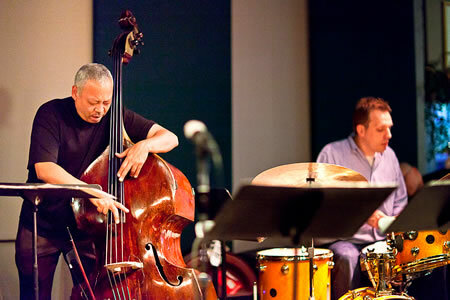 Jazz Northwest airs every Sunday afternoon at 1pm PDT on 88-5, KPLU and kplu.org. 9pm – Nathan Eklund Group, with Nathan Eklund (trumpet/flugel), Mark Taylor (saxophones), Dawn Clement (piano), Chris Symer (bass) and Byron Vannoy (drums) – CD Release! Ok … this has nothing to do with Seattle jazz but we were watching the World Cup this morning and this was an amazing last-minute win for the US. 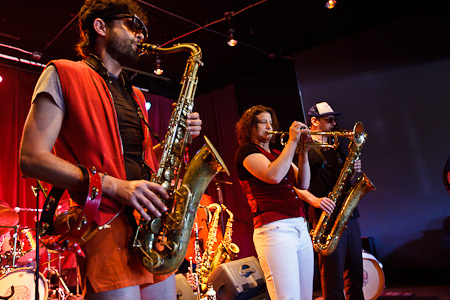 This week Tula’s Jazz Club features two CD Release Parties featuring groups with Seattle and national connections. 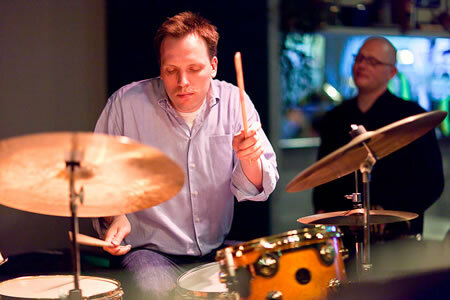 On Wednesday, June 23, drummer Jon Wikan returns to town for the release of “American Rock Beauty” with Danish guitarist Torben Waldorff and New York saxophonist John Ellis. 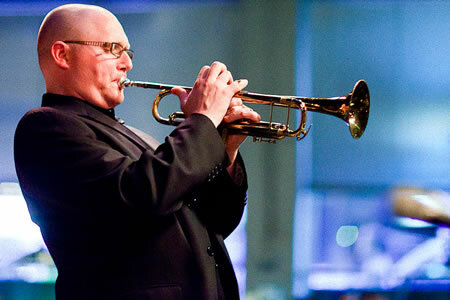 Thursday night, June 24, Thomas Marriott celebrates the release of his new CD, “East-West Trumpet Summit“, which is currently #1 on the JazzWeek National Airplay Chart and was recently featured on NPR’s Morning Edition. The “East” portion of the Trumpet Summit is usually Ray Vega, but because of family commitments Vega wasn’t able to make this performance. In his absence, Vern Sielert (still “East” of Seattle as Sielert is now teaching in Idaho), will join the band which also features Bill Anschell on piano, Phil Sparks on bass and Matt Jorgensen on drums. Make sure and call Tula’s and make a reservation for these events (206-443-4221). Organizers have cancelled the 2010 Calgary Jazz Festival because of financial constraints — just before the event was scheduled to start. In a written release, interim C-Jazz president Richard Sherry said the decision came after a six-hour board meeting on Saturday, two days before the festival was to open. The lineup for the festival this year included jazz legend Chick Corea, who was to perform Friday. Sherry said the “painful” decision to cancel the festival followed an in-depth examination of all its financial aspects. “For several months, the board had been asking the C-Jazz executive director for a detailed rundown of expenses and cash flow required for the 2010 festival,” Sherry said. He said the board thought “less pain would be inflicted on the artists, volunteers and jazz music fans” by cancelling the event before the opening instead of during the festival next week, which seemed likely. Arrangements are being made to enable refunds for people who bought passes or event tickets.